Fig. 1 shows the difference between A. parryana and A. patula for the hairs and glands of the nascent inflorescence. We've been confused in the past by observing glints in sunlight from A. parryana, and had called those plants A. parryana gold in the following text from the year 2002. 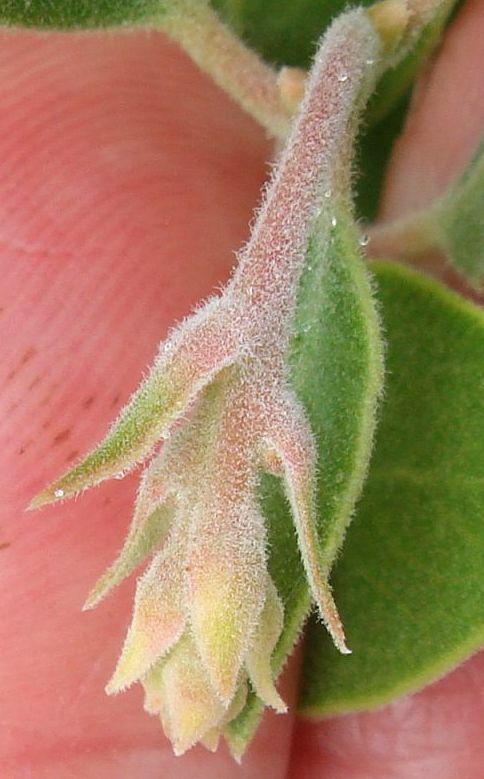 We still don't know what causes those glints, but those plants are solidly A. parryana, since the hairs of the nascent inflorescence looking nothing like the heavily-glandular ones of A. patula. Fig. 1. 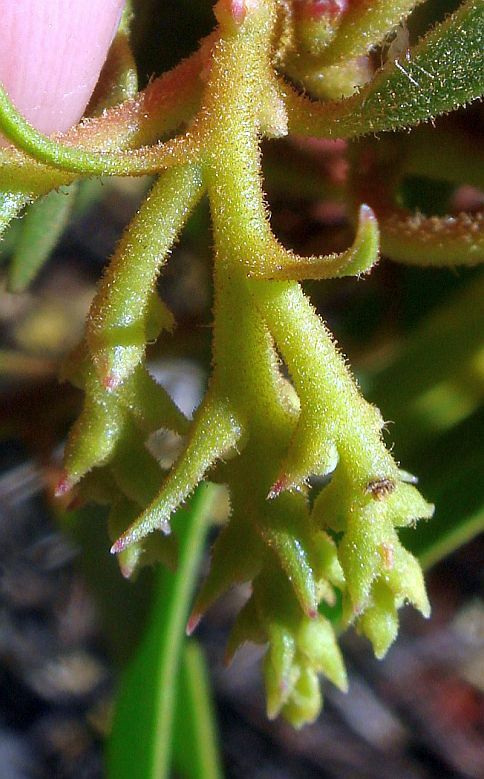 Left: A. parryana, showing the white hairs of its nascent inflorescence. Right: A. patula, showing the golden-glandular hairs of its nascent inflorescence. Click on the pictures for larger versions. We have begun a project to map the spatial distribution of the manzanita species in the San Gabriel Mountains. The following plots give the data we have gathered so far. We have kept separate the few A. parryana specimens that look mostly like A. parryana, but have a few golden-gland-tipped hairs. Just for fun, we identified the locations of all A. patula plants along the trail from Dawson Saddle to Throop Peak. Each point in the following plots represents either an individual A. patula specimen along the trail, or all specimens within 0.01-0.02 miles of that point. I.e., the long stretches of trail without any plotted A. patula points do not contain any A. patula specimens along the trail, and closely-spaced A. patula points should usually simply be connected with a straight line, indicating that many specimens are found in those locations. A. patula distribution along the Dawson Saddle to Throop Peak trail: spatial coordinates (map) and elevation vs. longitude plot. Copyright © 2002-2014 by Jane Strong and Tom Chester.